Feyre has grown so much since the first book, she's stronger and learning to settle in her new home until Tamlin betrays them to get he back. He still believes she belongs to him and has her back in the Spring Court with him despite her bond to the High Lord of the Night Court. She's now a spy within his court trying to find a way to cripple him before he discovers where her heart truly lies. One thing she doesn't plan for is that she may lose what she loves most in this battle of love and war. Rhys has so much more depth to him than Tamlin to me in the sense that his vulnerability is his strength. Tamlin comes off as sexist and sees Feyre as an object that belongs to him. He has some serious control and anger issues, which made me feel no sympathy to his situation. He's so obsessed with Rhys being a monster that he doesn't see the one within him. 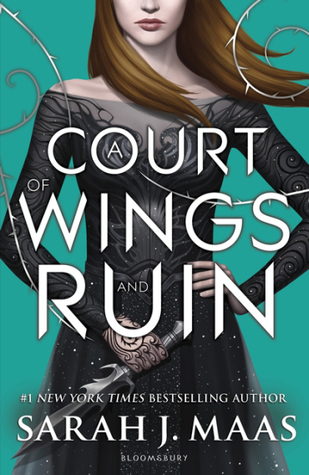 I was on the verge of tears throughout this entire book, some moments I could completely relate to Feyre and other characters as well about what they were feeling in those moments. they dreamed of. This book is about family, love and doing what's right even when told that it's wrong. It's about sacrifice in the face of much adversity. It's bloody but filled with so many emotional ups and downs that by the time it ended I felt bared open and not ready to part with these characters and this dream of peace. Now, a couple of times I had to remember I was listening to a young adult book because things got pretty steamy and reminded me of the romance novels I used to read. 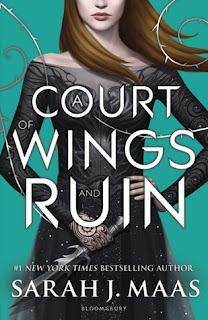 I wonder if Maas intends to write an adult romance since she knows how to bring the heat to a story and my cheeks. I think this book translated well into audio format and Cobb does a great job of bringing the story and characters to life. She maintains a steady pace and differentiates the voices of each character to give them distinction from one another. Cobb's voice works well with this book and was able to make me feel all the emotional aspects of the plot. In the beginning I could hear her breath every time she spoke but after a while it stopped and it didn't distract too much from the plot. The sound was clear and crisp other than that minor issue. Overall, I feel Cobb matched well for the narration of this book and she made it easy to visualize some very touching scenes that I didn't want to get out of the car at times. This is one that I could I listen to again. I'm a sucker for when a book/series has a strong family element. This one really hit you emotionally. I love when books do that for me. Thanks, it did and I'm glad I had the chance to experience this story. I enjoyed the family vibe of this book too. Glad to hear the audio version worked well for you. It just made the story so much more powerful.